Don't Eat the Paste: School is starting soon! So I made a little educational cube box. It's in PDF format because the images didn't fit my usual 100 dpi format for online printables. 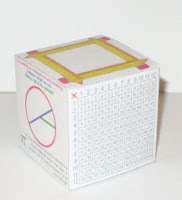 The images are of the completed cube, and what's on it, which can be printed out on one sheet if you'd like to use it for scrapbooking or a card. Click on that image to see it full sized. I spent HOURS on this. I hope you like it! If you look on the right, you'll see links to other things I do, including a page with dozens of boxes for all occasions, and all sorts of stuff for beaders as well. When I did the snail box and coloring page a while back, I mentioned it was inspired by a friend.She has been writing songs for snails lately and posting them with videos of snails here. love it , i am going to make them for our Bingo back to school party for my gradchildren and put a surprise inside. I plan on using this for the children at church. Thank you for a fun project.